A permanent magnet alternator (also called PMA, permanent magnet generator, PMG or magneto) relies on the magnetic field generated by a permanent magnet to convert mechanical energy into electrical power. It can generate AC current, with which it can power the whole engine and charge the battery. In this article we will focus on the typical structure of a permanent magnet structure and also give a brief introduction to its working principle. A modern alternator contains both moving and stationary coils of wire. 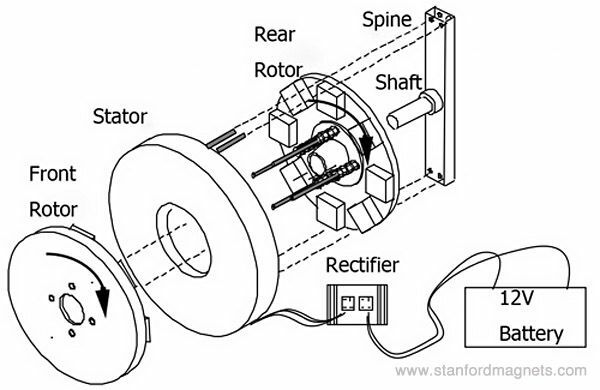 In the alternator, however, the moving coil, called the rotor, uses current supplied through slip rings to generate a moving field. Power is extracted from the stationary field coils. •The stator contains six coils of copper wire cast in fiberglass resin. It is mounted onto the spine and does not move. •The magnet rotors are mounted on bearings turning on the shaft. There're two rotors: the rear one behind the stator and the front one on the outside, which are connected by the long studs passing through a hole in the stator. •The blades are mounted on the same studs. They will drive the magnet rotors to rotate and move through the coils. During this process electric power is produced. •The rectifier is mounted on an aluminum &ldquo;heatsink&rdquo; to keep cool. The copper wire transfers the generated electricity to the rectifier, which works to change the AC to DC for battery charging.